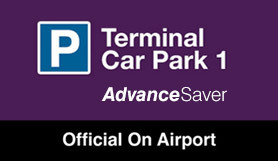 Luton Multi Storey Parking is walking distance from the airport, so there’s no need to wait for a shuttle bus. It’s an official facility that’s Park Mark accredited. Your car will stay safe in a crime free-zone with a covered roof to protect it from the elements. Choose a convenient parking space, pick up your bags and lock your door. Then head over the handy walkway to the terminal just two minutes away. It’s that simple. There are Blue Badge spaces on floors 0 and 1, so it’s adapted for accessible travel. It suits most motorists, but there are height restrictions of 2.1 metres — bear this in mind before booking. You’ll get the best Luton Multi Storey Parking rates on stays over 24 hours by booking ahead — secure your spot ASAP and save more holiday cash. The car park has a height restriction of 2.1m. Follow the signs for the Multi Story car park and on your arrival take a ticket from the entry barrier. Drive and park into the nearest available space and walk to check-in, which takes less than 5 minutes. Walk back to your car from the terminal and make your way to the exit barrier. Insert the ticket into the machine and the barrier will lift automatically. If there are any issues press the intercom button for assistance and have your booking reference to hand, so one of the team will be able to help you.